Takes Next Big Step !!! Thanks to generous help from the U.S. Army Corps of Engineers, installation of a new door at Harbor of Refuge Lighthouse is one step closer to becoming a reality. A contract has been let for fabrication of the door! "This is a major milestone in the preservation of Harbor of Refuge Lighthouse," said Judith Roales, president of the Delaware River and Bay Lighthouse Foundation, "but we wouldn't be at this point now were it not for the support of the Philadelphia division of the Corps of Engineers. Their participation in this project guarantees that the door will become a reality. They make it possible for us to move ahead even though the 2008 Door Campaign has not yet reached its goal." Meanwhile, the Door Campaign will continue as planned through the end of 2008 as funds are needed for parts of the replacement project beyond the door itself. The Corps' assistance with the door makes it possible for the Foundation to "do this project right" all at one time rather than piecemeal over several years. The total project includes stabilization and repair of the concrete "tunnel" through the caisson behind the door, redesign and construction of steps to fit the new doorway, and other items. 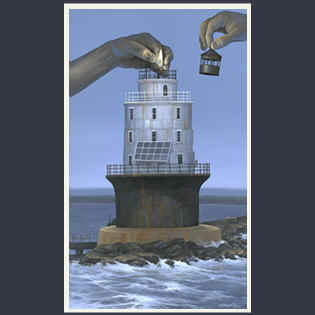 Popular Milton, DE, artist Abraxas has donated a print of his oil-on-linen painting of Harbor of Refuge Lighthouse with waves splashing over the breakwater and a distant ferry bringing tourists to the First State. The 16" X 12" print is signed by the artist and is number 790 of 900. The Foundation will sell the print with proceeds going to the Door Fund. The Foundation is now in possession of a variety of donated art that must be sold so that proceeds can be added to the Door Campaign total. Current thinking is that the sale should take place before Christmas, although no specific plans have been made. 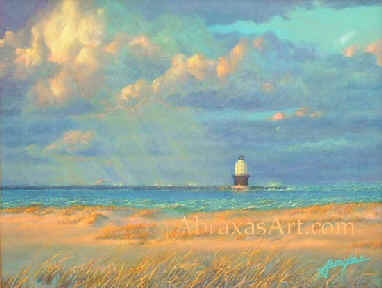 Items will include the signed print of Harbor of Refuge by Abraxas (seen above), a signed framed print of Harbor of Refuge by Damon Pla (left, without frame) that was donated by William (Barney) & Hazel Barnhill, and the hundreds of lighthouse models from the Harbour Lights collection donated by Charles and Sally Stevenson. The Foundation hasn't made a decision whether the sales will be by auction, raffles, on ebay, at local holiday bazaars, or some combination of all those methods. The Harbour Lights collection, especially, poses a sales challenge because of the large number of pieces and wide range of values for the individual pieces.